Hi, my name is Jane Nugget. I am a 27 year old woman in the third estate. I am a strong independent writer, I write about the French Revolution as it occurs. I live in France (obviously:D), and I have two younger brothers I look after. 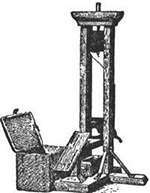 My father was kidnapped and murdered by the army of Maximilien Robespierre, along with my mother. They killed my mother because she could'nt help but cry. They tied her under the guillitine and forced her to watch my father get decapitated as his blood slowly dripped on mothers cold teary face. Even though I'm trying my best. I still can't compare to my dead parents. They had a plan. I am currently looking for clues left behind to save me and my brothers. If you ever need help just know that i am here to help and i will not hesitate to hide you and your brothers when the time comes. I have sworn to myself that i will help any innocent people to hide and run. Im sorry for saying this but no matter what you do i will find you and your brothers. even if you guys are hiding, or lock away somewhere.